 Set up in 2004, Miton Group, formerly MAM Funds, are a small active fund manager with just over £4.1 billion of client assets under their management. This small investment management firm currently manages 11 unit trust and OEIC funds and 4 Investment Trusts. Although they are a comparatively small fund manager, Miton and their funds have increasingly become a popular addition to many portfolios – notably their £1.3 billion UK Multi Cap fund, which is the 14th largest fund in the UK Equity income sector. To find out how well Miton funds have performed for investors we analysed each for performance and sector ranking over the recent 1, 3 & 5-year periods up to 1st January 2019. Our analysis found that each of their funds with at least 1 year’s performance history returned a loss in 2018. This analysis provides an insight into the performance of the funds and Investment trusts that are managed by Miton. 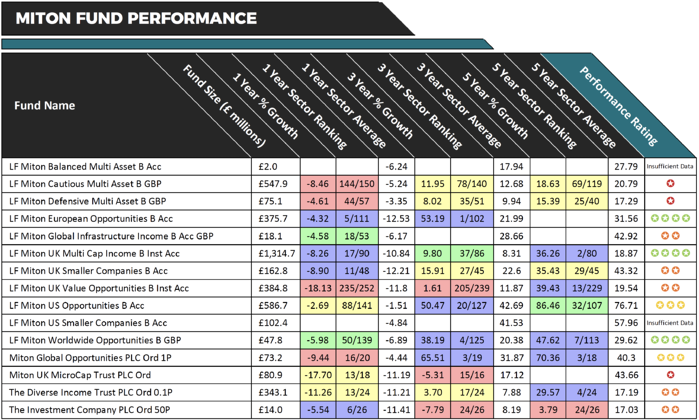 We provide the last 1, 3 & 5-year cumulative growth figures for each fund up to 1st January 2019 and rate each fund’s performance between 1 and 5-stars based on how well their performance compared alongside all other competing same sector funds over the same periods. One of the most consistent Miton funds is also their biggest. The Miton UK Multi Cap Income fund launched in October 2011 and currently this £1.3 billion fund accounts for 31.8% of Mitons total funds under management. This fund sits within the UK Equity Income sector where it has consistently been competitive and over the past 5 years it returned cumulative growth of 36.26%, which is better than 97.5% of competing funds within the same sector. Despite returning negative growth of -8.26% for the past year, this fund still managed to outperform 81% of its peers as the UK Equity Income sector took a battering with average losses of -10.84%. Another Miton fund to display strong performance was their European Opportunities fund. This young fund launched in December 2015 and has amassed funds under management of £375.7 million. With cumulative growth of 53.19% over the past 3 years this fund has been the top performing fund in its sector for the period. Over the most recent 12 months it managed to maintain a level of performance that outperformed 96.5% of its peers. The Miton Worldwide Opportunities fund was another to deliver competitive performance. Over the past 5-years this fund returned cumulative growth of 47.62% to rank 7th out of 113 funds in its sector. From their 4 Investment Trusts the Miton Global Opportunities was their strongest over the past 3 and 5 years returning growth of 65.51% and 70.36% respectively. This past year was a turbulent one for this investment as it fell down the sector rankings after returning negative growth of -9.44%, which was lower than 80% of its rivals within the same sector. The Miton Cautious Multi Asset fund and the Miton Defensive Multi-Asset fund have consistently struggled for performance. Over the past 1, 3 & 5 year period the £547.9 million Cautious Multi Asset fund returned -8.46%, 11.95% and 18.63% respectively. Each of these returns was below the sector average with the -8.46% returned by this fund last year ranking 144th out of 150 funds within its sector. Over the periods analysed the Defensive Multi-Asset fund also consistently performed worse than at least 50% of its peers with its 1, 3 & 5-year returns of -4.61%, 8.02% and 15.29% falling below the sector average for each period. The £384.8 million LF Miton UK Value Opportunities fund has one of the highest 5-year growth figures in its sector with returns of 39.43%. However, over the past 1 and 3 years, this fund has struggled in comparison to its peers with returns of 1.61% over 3 years ranking 205th out of 239 funds and falling well below the 11.87% 3 year average for the sector. Over the recent 1 year, it had significant losses of -18.13%, which was worse than 93% of same sector funds. The Investment Company Trust was another to struggle with performance in recent years with negative growth of -7.79% over the past 3 years ranking worse than 92% of its peers, and 3.79% growth over 5 years falling well below the 17.03% sector average. But during the turbulence of the past 12 months, this trust has climbed up the sector ranking by outperforming 77% of same sector funds. 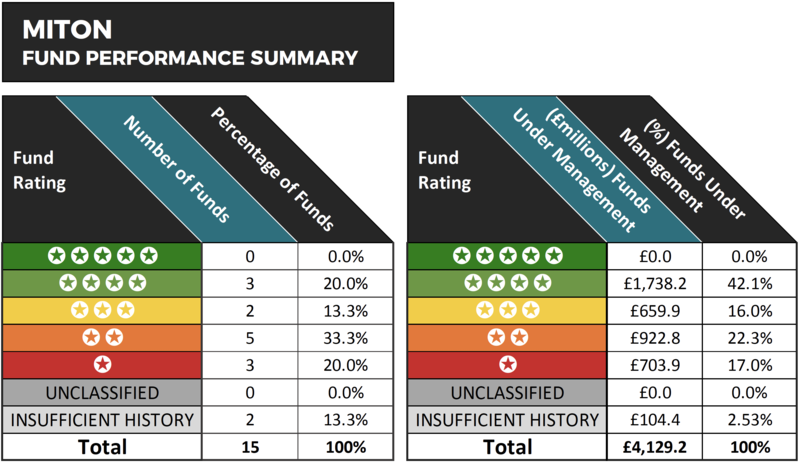 Our analysis rated 53.3% of Miton funds to have a lowly 1 or 2-star performance rating as they struggled to deliver competitive returns consistently, with a proportion providing competitive returns over different periods. Fluctuating sector rankings shows a lack of consistency from the majority of their funds over the periods analysed. But what is positive, is that 30.8% of their funds returned top quartile sector ranking in what was a particularly challenging 12 months. However, it remains to be seen whether or not they can maintain this level of performance going forward.